Detective: L.A. 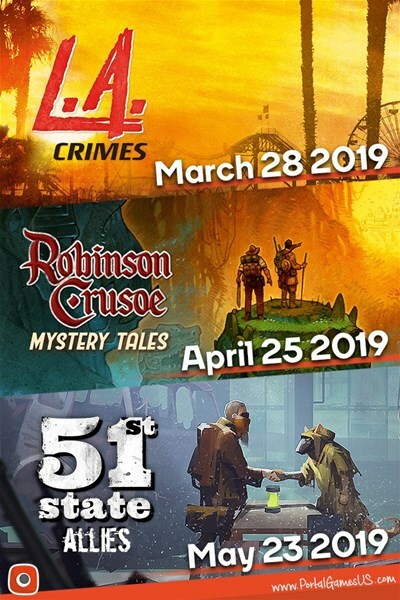 Crimes by Ignacy Trzewiczek and Mateusz Zaród, the first expansion for an award-winning (Game of the Year 2018 in Expert Category in France, Coop game of the year by Brawlin' Brothers, and more) Detective: A Modern Crime Board Game, will be available on March 28th. Expansion will let you play as a group of LAPD detectives solving three cases set in Los Angeles in the 80s. Together they form a short campaign. 51st State: Allies is the second expansion for 51st State Master Set, a card game by Ignacy Trzewiczek and Portal Games. In Allies, you will find new ways to ally your factions - cards are going to include a new alliance mechanism, that will grant you new unique bonuses and features. The expansion introduces three new factions: Iron Gang, Uranopolis, and Sharrash.